When crafters of the code put those laws into place, the idea was to prevent public officials and employees of government from giving preferential treatment to individuals, corporations or institutions, while performing official duties. Last weekend, the wife of President George Manneh Weah, First Lady Clar Weah, officially launched a foundation aptly named, The Clar Hope Foundation, presented as a non-political initiative aimed at creating an equitable society in Liberia where women and children are healthy, provided education and fully empowered to lead a prosperous life. When the foundation was launched in June, the First Lady listed the construction of maternity hospital, schools and the Hope Community for the less fortunate as well as advocating against gender-based violence and implementing agricultural programs among the goals for the organization. Launching the foundation at the weekend, the First Lady said her goal was to give young people and the elderly hope. On Sunday, while addressing a gathering about the foundation, the First Lady revealed that while the government is allocating some money for her office in the national budget, that money is not enough and that she would need an additional US$10 million to complete her ongoing projects and maintain them after completion. Under the current fiscal year 2018/2019 budget, a total of US$1 million is allocated for the office of the First Lady under the Ministry of State for Presidential Affairs/Humanitarian Outreach. Despite that amount, the First Lady says she needs more, telling a gathering on Sunday she is currently seeking international help to raise money for Liberia. Madam Weah explained that she could not actively engage with Liberia during the civil war because her husband who was an international football icon was busy with his craft and she had to care for the children. Records from the Division of Corporations in the US State of Florida obtained by FrontPageAfrica show that the Weahs did register a foundation named “The Weah Children Foundation Inc.” However, the document filing number N0400000005623 shows that the foundation was never active since its formation on March 30, 2004. The account is still listed as inactive with administrators of the account posted that the account was dissolved on September 14, 2007. Critics have questioned the Weahs’ decision to start a foundation now when they could have done so when Weah was in his prime or after his retirement from football. On Sunday, the First Lady said the US$10 million will go toward her ambitious Clar City of Hope project. The project reportedly set for construction in Marshall, will include an Administration building, a social club, school, library, nursery, restaurant, dormitory, vocational center and a sport center square. 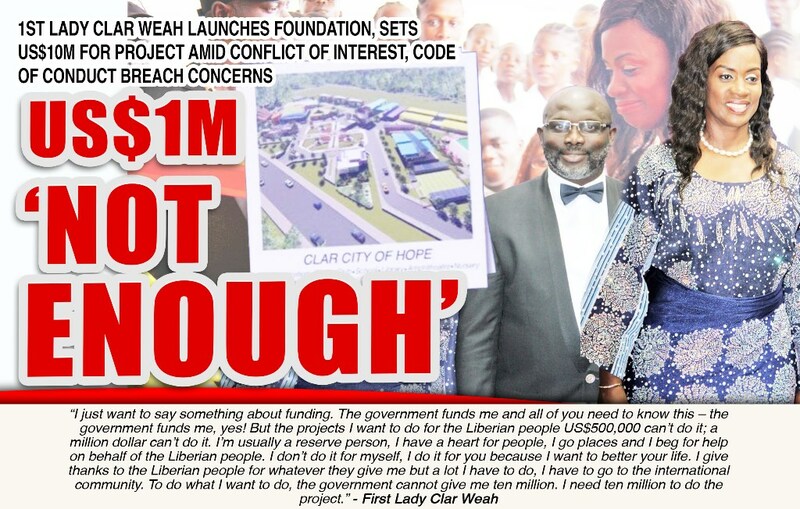 In a clear sign of conflict of interest, FrontPageAfrica has learned that the land was purchased in the name of the First Lady and not the government or her office, meaning funds raised on behalf of Liberia as stressed by the First Lady would go toward her personal project and not Liberia. Questions are also being raised about the ownership of the project after the Weahs leave Offices in the future and whether the government of Liberia would retain ownership. Despite the First Lady’s expression of good intent, many international stakeholders are raising concerns, particularly with the President and his wife establishing a foundation while in office. Former President Ellen Johnson-Sirleaf came under similar questions during her term regarding Chevron funds and her son, Robert Sirleaf. Last July, a damning report, published by the Sustainable Development Initiative (SDI), suggested that President Sirleaf relaxed some established protocols, and that her son Robert, through the National Oil Company of Liberia’s (NOCAL) social development programs and his (Robert’s) own foundation, might have misappropriated over US$10 million from Chevron-Liberia. The report noted that audit documents obtained from the General Auditing Commission (GAC) pointed to gross misspending of Chevron’s social development funds by NOCAL and the Robert A. Sirleaf Foundation (RASF). According to the SDI, the US$10.5 million was allegedly injected into tax-deductible community development projects across Liberia from 2011 to 2014. These funds, established through the Chevron-Liberia Economic Development Initiative (C-LED), were intended to deliver 80 projects focused on enterprise development, health and education across the 15 counties for social and economic benefits for women, children, and youth. The issue is quite familiar to the current ruling party, headed by President Weah. 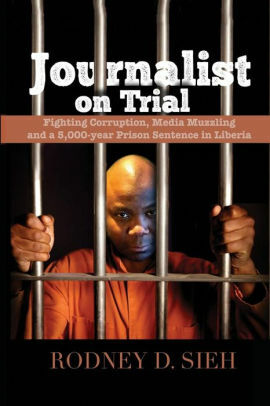 In 2012, while in the opposition, the party’s youth leader was taken to court by Sirleaf’s son, Robert, who Mr. Jefferson Koijee accused of becoming a billionaire while siphoning oil funds to his private foundation. Robert Sirleaf’s lawsuit expressed unhappiness about a comparison between him and the son of Equatorial Guinea’s President, who has been accused of misusing his country’s oil funds. Similarly, Representative Acarous Gray (Montserrado County, District No. 8), on numerous occasions threatened impeachment of President Sirleaf. Issues of conflict of interest and Code of Conduct violation are not new to governance in Africa. In fact, many former presidents and their families have landed in trouble after leaving office over similar concerns. Leaders and their families starting up foundations is usually a red flag for trouble and has been known to draw unnecessary attention and scrutiny. This is why most set up foundations after leaving offices. A case in point, former US President Bill Clinton set up his Clinton Foundation charity after he wrapped up his presidency in 2001 with the idea of bringing government, businesses and social groups together to tackle big problems. The foundation is made up of 11 non-profit groups that work on four major issues: global health and wellness, climate change, economic development and improving opportunities for girls and women. But even amid their expressed good intentions, questions arose when former President Clinton’s wife, Hilary decided to run for President, triggering concerns about transparency even prior to her presidential bid when she served as Secretary of State. Critics charged that some donors, especially foreign governments, may have been trying to buy influence. Next door in West Africa, Senegal’s example offered perhaps the clearest example of how ruling families can easily run into trouble – even if on the surface they aim to do well under the guise of private foundations. This was evident in March 2010, when former Senegalese President Abdoulaye Wade claimed 35 percent of an extravagant statue’s tourist revenue for one of his private foundations run by his daughter, Sindiely Wade. The President went on to justify his appropriation of the infamous “35 percent” because of “intellectual property” rights. The 328-foot statue estimated at US$70 million marked a striking symbol of corruption in Senegal under Wade. Four years later, his son, Karim Wade was sentenced to six years in prison for corruption and fined $230m (£150m) for illegal enrichment during his father’s 12-year rule. Karim Wade was accused of illegally amassing about US$1.4 billion but was cleared of some of the charges by a special anti-corruption court in the capital, Dakar. At his sentencing, the judge said Wade had hidden away funds in offshore companies in the British Virgin Islands and Panama. In Indonesia, where President Mohamed Suharto ruled from 1967 to 1998, he was accused of embezzling between US$15 billion to US$31 billion during his 31 years in office. Suharto was accused of using a system of patronage to ensure loyalty, while cementing his control of state-run monopolies, and special tax breaks to companies owned by his four children, family members and close friends. Under Suharto’s rule, businesses looking to gain access to the Presidency used Suharto’s crony business activities and family foundations to cut bureaucratic red tape. Jean Claude Duvalier, who ruled Haiti from 1971 – 1986 was also accused of amassing US$300 million to US$800 million during his 15 years in office. Nicknamed “Baby Doc”, Duvalier inherited Haiti’s presidency aged 19 on the death of his father François “Papa Doc” Duvalier, in April 1971. The International Monetary Fund (IMF) in 1980 reported that some US$22 million in aid were siphoned off, with US$16 million going to the Duvalier family through foundations. Apart from a case being appealed in Switzerland (of US$6.5 million), the only other asset recovery related case recorded, is the long running proceedings involving Duvalier assets held in the name of the Foundation Brouilly. Based in Liechtenstein, the Brouilly Foundation is owned by a Panama-based company, which in turn is owned by members of the Duvalier family. It is such practice that the Liberia’s Code of Conduct aims to guard against, avoiding a situation where businesses and investors who contribute to foundations like the Clar Weah Foundation would enjoy free access under the guise of contributing to the foundation managed by the First Lady. The concerns over the First Lady’s foundation comes as the Weah-led government is struggling to explain how some L$16 billion allegedly vanished into thin air without an explanation. More importantly, the government has been unable to explain how US$25 million intended to be infused into the economy in a bid to curb the rising US exchange rate was distributed. All this coming amid even more chatters over President Weah’s personal assets and the lack of transparency and accountability in the administration. To date, the only declared asset made public of the President is the one he filed in 2005 when he contested the Presidency but lost to Madam Ellen Johnson-Sirleaf. The President has resisted several calls for him to declare his assets and when his office finally announced that he did a few months ago, it was not made public. The questions surrounding the President’s assets come as many are questioning the construction of a 46-unit property off the Robertsfield Highway opposite the Baptist Seminary, another 26-unit complex behind the seminary area, the reconstruction of his 9th Street property and the refurbishing of his Jamaica Resort – all since he took office in January.